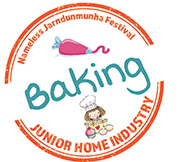 The aim of the Baking category is to encourage children’s interest and involve them in the baking process. We would like to create an interest in the next generation about where their food comes from and how it is made. Exhibits must be presented on a sturdy disposable plate. Once delivered, the exhibit becomes the property of Nameless Festival and will be disposed of at the conclusion of the competition for Health & Safety reasons.